Do I Really Wanna Blog? : Tennis Anyone? I don't like to watch it on TV. And I definitely do not like to play. I have been sucked into playing touch and indoor netball in the past. "Don't give me the ball!" If someone throws a ball at me I'm more likely to hide my face in my hands rather than try to catch it. I'm 5'2" on the outside and a 6' big chicken on the inside!! So, like I said...I hate sport! Tennis has always been a part of my life. I remember as a very small child, going to Mass on a Sunday morning then going to the tennis courts nextdoor to watch Dad play in the local fixtures. He was pretty good! I remember as a primary school age child, my Saturday mornings were filled with tennis coaching. I didn't have individual coaching, it was with a group of kids, including my younger brother. The coach was a distant cousin of my Dad's. He was very nice but I think I did his head in trying to work out whether I should play left or right handed. I am a leftie, but I naturally picked up the racquet with my right hand. For a while I served right and played left. Now I play right, but my backhand is my best shot...because I add my left hand. I also remember playing with my team on a Sunday. Mum was the manager. My brother was also in the team. 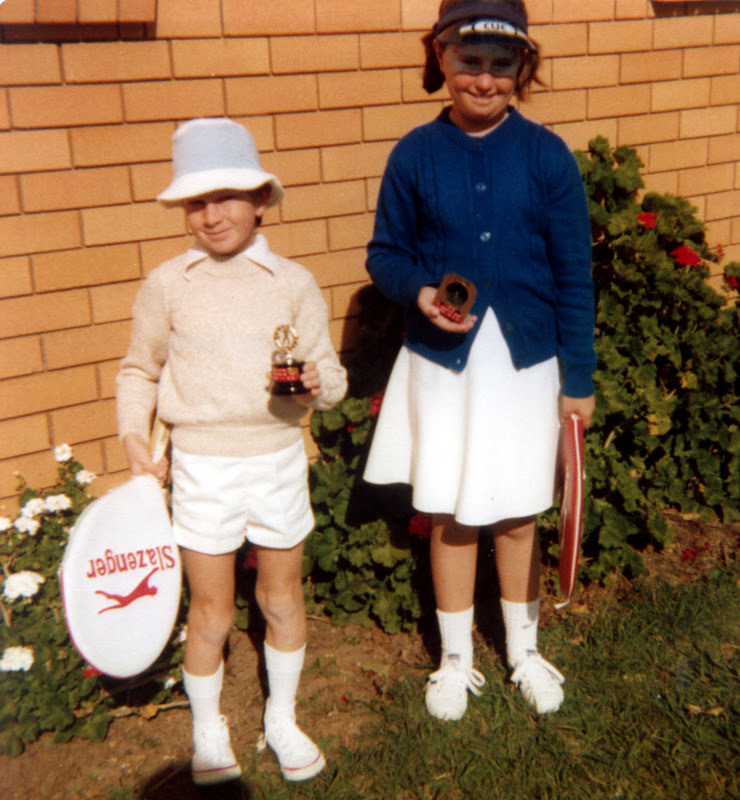 We played in tennis competitions in our small country town. And the only two trophies I have ever won in my entire life are tennis trophies. Both for doubles, both for runner up. Me and my brother, with our trophies! I remember during my high school years having a massive crush on Stefan Edburg. It was so serious that I would wear blue & yellow (his Swedish colours) and cheer for Sweden rather than Australia in the Davis Cup! I haven't played tennis for years. But it's the only sport I do like to play. I'm not great at it. But I do enjoy it. When we walk to school and walk right past the tennis coaching in action I secretly hope that one day both of my kids will want to play tennis. Right now I'm watching Australian Open. And I'm relishing in it. I'm watching Anastasia Rodionova and Caroline Wozniacki. It looks like the Aussie might not win this one. But tennis is the winner for me! PS This is my 700th post! A round of applause, please? I do love sport, but usually don't have the patience to watch it on tv. My neighbours daughter is playing in the Australian Open at the moment, so I have been paying attention on and off today. I find tennis easier to watch on tv than live! I love watching the tennis but I can't play to save myself!! Wasn't the red dress tonight stunning. It's a shame the Aussie didn't make it through, maybe if her dress was prettier she would have done better? I like tennis too Thea. It seems it's been a part of my life forever also. My Nana was a great tennis player and I have fond memories of watching it on Tv with her during the Summer months as a child. Hubby is a good tennis player too and Mr4 actually received 2 really good tennis racquets for Christmas. So guess what we played a bit of while we were away on holi's... you guessed it! That is soooo funny. Thea, I think I could've written this! 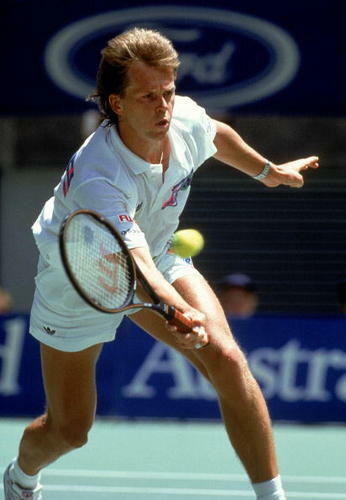 I had a major crush on Stefan Edberg too, right down to decoupaging my school planner front covers with pictures of him! It was all about tennis for me. And then Goran Ivanisevic (gawd I've forgotten how to spell his surname, some fan!) came along and while I remained loyal to Stefan... well, I had to go with the mysterious and fiesty Goran. Hahaha. I've had lessons two times in my life now, and I do love it, but have no one to play with. Or that has been my excuse up until recently--now my oldest is taking lessons. Now my excuse is that we can't afford the court hire AND to pay for Mr8's lessons. I think I need to stop making excuses and make tennis my winter sport. Thanks for reminding me that I love tennis. I love watching tennis and playing it, although I've had a break from playing for the past few months. January is my favourite month of the year as I get to watch a whole month of it - heaven for me, hell for my husband! I don't have a favourite at the moment, although I have joined the Tomic bandwagon as he is just so ridiculously talented and full of potential. I'm going to savour this last week and watch as much as I humanly can so I can store it up for the barren tennis months in front of us! Awww look at little you with your trophy! so cute! Tennis is the only sport I watch on telly too, though I haven't been sucked into it this year, I have watched a couple of matches.